Some of our alumni participants from the Summer Work Travel program write about their experiences and where this program has taken them throughout the world! Please join us for our second feature of alumni reflections from participants in China, as they detail the relationships they created, skills they acquired, and careers they have earned. We’re so excited to share these success stories with our larger Greenheart family! My name is Jun Li, and I took part in the Summer Work Travel program for three summers from 2013-2015. The program has had a really big impact on me in several ways. Thanks to this program, I have learned to become more independent and brave. In 2016, I applied to be a volunteer teacher in Nepal; this was a life-changing experience. Then, in 2017, after accumulating many overseas experiences, I applied for a master’s degree in Management Science at The University of Nottingham. I am studying at the university now, and I am really enjoying learning a lot of great things. Thanks to the Summer Work Travel program, I have become much more mature and focused on my own future! You can gain valuable skills for your future too, explore Greenheart’s Work and Travel Program today! My name is Xinguang Li, and I took part in the Summer Work Travel program in 2012. The one hundred days that I participated in the program were the greatest contributors to my own personal growth and also the proudest experience on my resume. After returning from the United States and graduating from my university in China, I went to South Korea to further my education. Three days after graduating, I received an offer from an American company. Now, I have worked at the company for almost a year, and I have greatly enjoyed my experiences here. Although most of my colleagues are Korean, I have met lots of engineers and project managers from the head office in the United States. They were very interested in my experience during the program, and I was happy to share with them. This program helped me gain valuable experience and cultural knowledge that has allowed me to be a marketable candidate for many jobs. You can gain relevant job experience and develop valuable skills with Greenheart’s Summer Work and Travel Program! My name is Shiyun Chen, and I took part in the Summer Work Travel program in 2012 and 2013. I love this program so much. I used to feel that the world was so far away from me and that I was just an ordinary person until I participated in the Summer Work Travel program. I had never thought about traveling or going abroad, which I always thought was out of reach. This program not only allows you to go to the United States to work and travel but it also increases your knowledge, opens your mind, and inspires you. I believe every participant of the program has their own unique experiences, and they are all life-changing and impactful. My own experience has allowed me to start working in a luxury brand store in Macao with a nice salary that allows me to travel several times a year and further expand my cultural knowledge. Gain your very own unique experiences and work abroad with Greenheart’s Summer Work and Travel Program! My name is Yang Bai, and I took part in Summer Work Travel Program in 2013. The program has had a deep impact on my view of the world and my life. My supervisor, Phoebe, told me some words that made the biggest change of my life: “Everyone is equal; the only difference is the division of labor in society.” I worked in customs at the Xianyang International Airport after I graduated from my university. My job was to check the passengers and the international flights. Thanks to my English skills, which I greatly improved throughout the program, I did my job very well. I felt a lot of appreciation from my colleagues and managers, which made me feel very good about myself. 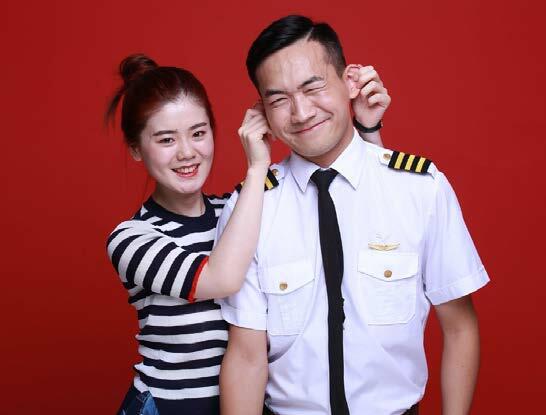 One day, my colleagues told me that China Eastern Airlines was hiring flight attendants. I set up an interview and was lucky enough to be hired by the Airlines. Next, I heard the company was hiring pilots. I was qualified for the position, so I went to take the interview. Again, I was lucky enough to become a pilot. Aside from the technical skills I learned from my education, what made me an even more attractive candidate for these jobs was my experience abroad with the Summer Work Travel program. The cultural knowledge I gained from the program provided me with a unique skillset that I have brought to my company. I learned a lot from the program, including sharing, equality, and communication skills. These skills, along with my experiences during the program, have allowed me to become a competitive candidate for many jobs within my career, and I am incredibly grateful to have experienced the Summer Work Travel program. Expand your career horizons with the skills you will develop from Greenheart’s Summer Work and Travel Program!